I've often wondered how long we could last for food without going to the shops. Of course there are things you'd run out of pretty quickly like fresh milk, fruit and vegetables but if you had a reasonably well-stocked storecupoard and freezer I reckon you could easily survive a week. Late back from London so I skipped supper and had a banana. Easy. A glass of freshly squeezed orange juice, and stewed plums with Greek yoghurt and granola. Feta cheese and red pepper tapenade quesadillas. with a chunk of cucumber. Heat a frying pan, add the oil or butter then once it’s melted tip in the onion, stir and leave over a low heat to fry. Pour a kettle of boiling water into a large saucepan, bring back to the boil, add salt, then add the pasta, stir and cook for the time recommended on the pack. Before you drain the linguine set aside half a cup of the boiling water. Add 3 tbsp of water to the onion and tip in the crumbled cheese. Leave over a low heat to melt then stir in the cream or yoghurt (I used yoghurt which was fine) Drain the pasta and add to the pan along with the parsley and toss well together, adding a splash more water if you need it. Season generously with black pepper. Spoon into a warm bowl and sprinkle over some grated Grana Padano or Parmesan, if you have some. Some dark leafy green salad would be a good accompaniment. I forgot to tell you - I acquired a pressure cooker. A reasonable deal on Amazon - 50% off - but . . . It's just as bad as they always used to be, except marginally less scary. Now you may well have a pressure cooker and love it to bits but here's why I don't like them. I've made two things with it, a chicken stock and some cannelini beans and both would have been better if I'd made them the conventional way. The handbook advised me to cook my chicken carcasses for 40 (yes, forty) minutes which seemed an incredibly long time but as I hadn't used it before I took their word for it. Of course it came out cloudy and slightly bitter-tasting. Better when it was skimmed but I ended up - most unfrugally - throwing it away. The beans, I was told, didn't have to be pre-soaked, simply submerged in boiling water for an hour which seemed like a good time-saving notion but it was far from clear how long they needed to be cooked. The handbook didn't mention them. It recommended 5 minutes for haricot beans, 10 minutes for small butter beans and 15 for kidney beans to which cannelini beans are related. I decided to give them 12 and found they'd started to fall apart when I opened the cooker. I also thought they were less digestible than usual though that may be my imagination or general grumpiness about the whole enterprise. I'll give it another go but if all else fails at least I've got a large saucepan for cooking pasta. Unless you're pulse-mad and cook them a couple times a week from scratch I wouldn't bother. Shopping splurge vindicated! Well, almost. I made this fantastic Iranian-style chicken stew last night with half of the fresh herbs and the dried limes I bought. It was loosely based on a recipe in Sally Butcher's Persia in Peckham, the book I told you about yesterday but since I seem to have got fixated on lamb lately I used chicken thighs instead and went off on a tangent from there. The essential ingredient is dried limes which is one of those addictive ingredients that you can't stop craving once you discover them. They're unprepossessing little brown husks which you pierce then pop in a chicken soup or chicken or lamb stew to release their exotic musky fragrance and sweet-sour lemon flavour. If you feel a bit nervous about the idea imagine them with handfuls of fresh herbs including stacks of the equally addictive coriander. It's a great dish to serve for adventurous been-everywhere-eaten-everything friends. I've posted the recipe on my student website beyondbakedbeans.com today. Confession time. Last night I had a far from frugal shopping spree - the equivalent of a dieter having a couple of slices of chocolate cake or a teetotaller falling off the wagon. But it's a temptation to which any foodie is prone. I'd been looking forward to going there since I found out about it a couple of months ago. Although it sounds like an Asian sweet shop it is in fact a fabulous Aladdins cave of a grocers with every type of herb, pickle and spice you could possibly want. Now I know that most of this stuff will keep - apart from the fresh herbs - and that it would be ridiculously easy to spend this amount in a high street pizza joint but it isn't frugal by any stretch of the imagination. What I should have done was go with a shopping list for a specific recipe rather than try to source any ingredient I might possibly need. And not go shopping when I was hungry - always a mistake. Still, some exotic meals to come, hopefully. Will let you know how I get on. ps If you want to be tempted too the Bristol Street Mart is at 78-82 St Mark's Road in Easton. Apparently Ainsley Harriott went there the other day, the owner told me proudly! A press release from Jamie Oliver's (or possibly Sainsbury's) people dropped in my inbox to announce that Jamie would be fronting a new 'Feed your Family for a Fiver' drive. He's a good bloke, Jamie, but you have to admit it's a bit ironic being paid 1 or 2 million pounds, whatever it is by Sainsbury's, to tell us how to survive on a shoestring. And Sainsbury's could presumably have lowered their prices at any time to help the cash-strapped families they're suddenly so concerned about. As I point out on my student website beyondbakedbeans today, take a look at some of the other prices they're charging for fresh ingredients. 99p for a cucumber! You have to be joking. So on the one hand we have one millionaire celebrity chef (Jamie) telling us to tighten our belts while another (Delia) tells us to go out and spend, spend, spend to save time. It's a bit like Labour turning out to be the party of big business and the Tories turning all touchy-feely and green. It's a topsy-turvy world we live in. We've been away for a couple of days over Easter so we don't have any leftovers to finish up. But this is the kind of weekend that generates them so I'm wondering what I would do if I had. First turkey, which is now almost as popular an Easter meal as a Christmas one. The most helpful approach, I find, is to divide the leftovers into three categories - white meat, brown meat and the carcass. White meat's not the problem. Everybody loves it - it eats well cold: in sandwiches or in salads. The key things to remember are to cover the bones with cold rather than hot water which will make the stock cloudy, to skim it once you've brought it to the boil (again to keep it clear) and to cook it slowly so that you don't extract the more bitter compounds from the bones. Then cool it, refrigerate it and skim it. That may sound like quite a palaver but it's a routine that becomes familiar and it's worth it for a really great tasting base for soups, stews and risottos. The only thing I don't do is pick the meat off the carcass once it's boiled. It's simply overcooked by then and all the taste and texture has gone out of it. If you've saved some of the leftover turkey meat for a soup add it at the last minute. Heat it through thoroughly, yes, but don't cook it for longer than you need because it's been cooked already. The best use, I think for leftover lamb is a middle-eastern style pilaf with dried apricots and nuts. Again don't re-cook the lamb in the stock when you cook the rice. Chop or shred it, fry it in a separate pan (with the nuts, if using) until lightly browned,then fork it through the rice once it's absorbed all the liquid and other flavourings. Turn the heat off, leave a lid on the pan and leave for 5 minutes for the flavours to amalgamate. At the last minute I abandoned the idea of pan-fried trout and almonds because my neighbour downstairs told me that she always used to wrap trout in old newspaper to bake it and that seemed such a brilliantly frugal thing to do I couldn't resist it. The only downside is that you lose the baking juices which tend to sink into the paper which seems a bit wasteful but you can simply pour over a little extra melted butter and a squeeze of lemon - or of course, make a more elaborate creamy herby sauce. I was so excited by the whole process I forgot to take a photo but I guess you'll get the picture. My impression up to now is that if you don't like farmed or tinned salmon (which I don't much) and don't like bones and don't want to eat unsustainable fish or fish that's been flown half way round the world there aren't a lot of options. But in a world of rapidly rising food prices fish seems to have stayed relatively stable. Cod steaks at £2.79 for 568g. Oddly if cod is in a block it's cheaper. Fine for chowders. Enough for four. 2 x rainbow trout for £2.81. That's our supper tonight with the leftover almonds from the weekend's couscous. Boil in bag kippers at 62p for 220g. OK, I don't much like kippers but it's a cheap weekend brunch if you do. 2 pollock fillets for £2.42. Pollock is sustainable. Hurray! But slightly tasteless so needs a garlicky tomatoey or similarly gutsy sauce with it. 220g of 'Seafood Medley'(I hate the word medley) for £2.99 on a two for one offer. Enough to make a seafood salad (with a Thai-ish dressing I suggest) and a pasta sauce. Scottish rollmops at £1.09 for 260g. Easily enough for one, maybe two. Good with some crusty bread and a cold lager. Marinated herring at £1.59 for 280g. Great base for a Scandanavian-style herring and potato salad. With dill if you can find some at a reasonable price. Smoked mackerel at £1.87 for 292g. You could make a decent size batch of paté with this or a filling for a large quiche. Smoked mackerel is a great buy. So, plenty of reasonably priced options then. And think of the good all that oily fish will do you . 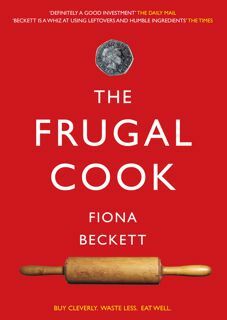 . .
Should frugal cooks forget the idea of seasonal food? It was cheaper to buy out of season strawberries than in-season rhubarb. By quite a margin. 400g of Spanish strawberries cost £1.59. 400g of rhubarb - admittedly Dutch so it had some way to travel - was £2.99. I thought rhubarb was supposed to be a UK crop at this time of year. It seems part of a growing trend I've spotted for shops to charge more for in season foods rather than less. Like Purple Sprouting Broccoli which is £1.75 for half a kilo in my local greengrocer. It's like 'we're doing you foodies a favour by stocking this at all so we're going to charge you through the nose for it'. The only remaining arguments against buying out of season strawberries are the not insignificant factor of the air miles they clock up and the fact that they don't taste of anything (although I've found if you cut away the un-ripe white flesh by the stalk, slice and sprinkle them with sugar and let them macerate for 10 minutes they taste a whole lot better). Maybe we should all be buying frozen fruit instead . . . I'm completely converted to cooking with meat on the bone. It's cheaper and it's much, much tastier. True, it's a bit more work. It also tends to be fattier so you have to make your stew, cool it, take the meat off the bone (not essential but people find it off-putting and it looks a whole lot better), refrigerate it and skim off the fat but you're left with a really fantastic meal for the following day(s) which need no effort or last-minute attention. With a sharp knife trim any obvious excess fat off the lamb knuckles. (Don’t worry too much, you’re skimming the stew later on). Infuse the saffron, if using, in the hot stock). Heat the oil in a deep frying pan or sauté pan and fry the onions and carrots over a low heat until starting to soften. Add the garlic and spices, stir then stir in the passata and stock. Add the lamb knuckles, mixed fruit and thyme and bring bring slowly to the boil then turn the heat right down and simmer for 2 hours. The liquid probably won’t cover the meat at this stage so you may need to turn the lamb knuckles every half hour or so. Cool the stew, removing the meat and bigger chunks of vegetable before it’s completely cold. Chill the liquid then skim off the fat. Cut the meat off the bones, removing any remaining skin or connective tissue, cut into large chunks, and return to the pan along with the skimmed liquid and a glass of red wine or stock. Reheat gently. Season with salt and pepper and an extra pinch of cinnamon if you think it needs it. A quick overnight trip to Wales to research a piece on lamb proved an unexpected source of bargains. Apparently the producer (a partnership of two farmers who trade under the name Gower Salt Marsh Lamb) can barely give their cheaper cuts away. They couldn't have been more delighted when I picked a pack of lamb knuckles (£1 each) and one of kidneys (given away) rather than walking off with one of their few remaining packs of lamb steaks (the salt marsh lamb season having ended in December). It's apparently the same with hearts and other offal. It's certainly a cheaper way of buying meat than in farmers' markets many of which have become quite expensive so if you have a producer near you I'd go direct to the farm gate. And always travel with a coolbag! I'll let you know what I do with my booty which is currently thawing gently in the fridge. Even though I know tomatoes are not in season every so often I crave their clean-flavoured freshness as opposed to the cooked taste of tinned tomatoes or passata. Especially for tomatoes on toast. The problem of course is that they're still underripe but that can be countered by dry-frying - or nearly dry-frying them so that they acquire something of a chargrilled flavour. I char the toast too. The ideal pan for this is one of those ridged grill pans but you can use an ordinary frying pan. You heat it for a couple of minutes till hot, take a slice of decent country bread, spray or drizzle it both sides with olive oil put it face down in the pan and grill/fry it both sides. Then you rub a cut clove of garlic over the surface (as they do in Spain). While the toast is cooking you cut 2-3 tomatoes in half and rub the cut surfaces with olive oil and season with salt and pepper. You place them cut side down in the hot pan and leave them for about 4-5 minutes until nicely charred (see below) then flip them over and cook for another 2-3 minutes the other side. Pile them on top of the toast, scatter over some chopped parsley if you have some and trickle over a little more olive oil and (optionally) balsamic vinegar. I also like a bit of goats cheese crumbled on top. Finally made my short rib recipe over the weekend and what a great meal it makes! You basically tackle it just like a stew - brown the meat, sweat off some onions and carrots. stir in a couple of tablespoons of tomato paste, a little flour then pour in a good half bottle of leftover (but still drinkable) wine. Bring to the boil, pour over the ribs (tucking in a couple of sprigs of thyme along the way and adding extra water to cover if you need) then cook over a very low heat or in a very low oven for 3 1/2 to 4 hours - it needs that long to render down the fat and make the meat fork tender. Then, very important, cool the dish down and refrigerate it which makes it much easier to remove the layer of fat which will have accumulated on the surface. Underneath is the most wonderful jellied winey stock. Add another slosh of wine (about 75ml) before reheating and there you are. The great bonus is that there is - or should be - a lot of liquid - enough to pour off some, strain it and freeze it to make an instant sauce for a couple of steaks or, more frugally, add instant oomph to a spaghetti bolognese or a cottage pie. In fact if you have any meat left over I'd advocate making the splendid French version hachis parmentier which contains a good handful of parsley which goes particularly well with the rich winey sauce. If you think of this dish as a beefy equivalent to osso buco you'll get an idea of just how much the bones and fat contribute to its richness and depth of flavour. We had it with veg (mash and kale) but I think I would serve it with polenta on another occasion. I finally found a beef cut that's popular in France but hard to find here (back in England) - cotes de boeuf or beef ribs, ironically sold at my local organic butchers as pot au feu. It's not ridiculously expensive at £8.75 a kilo (though that includes quite a lot of bone and fat) and should easily serve four. But it would have been no more than 8 euros a kilo (about £6) in France. It underlines just how pricey so called 'cheap cuts' have become - including mince and braising steak. The only thing that's really cheap still is offal and how many people like offal? Not a lot. I managed to spend £33 just now on restocking the fridge and storecupboard - admittedly just over £19 of that at the health food shop (on yoghurt, eggs, granola, oatcakes, crackers, hummus and two different cheeses for which I realise they've managed to overcharge, not intentionally I'm sure). That's just this weekend's eating. Prices have definitely gone up in the month we've been away, but why are they so much more expensive here than in France? There'd be rioting on the streets if the shops charged as much there. Frantic last-minute packing - no idea why it's always this chaotic. However enough time to zap down to the local supermarket (Intermarché) and stock up with a few foods (and the odd drink) that are more expensive in England than France. Or which it's not easy to get hold of back home. Cornichons - Look like but taste better than gherkins. I like the fact one brand is called Christ. One thing you might make a mental note to bring with you next time you come to France is tea. They just don't get it here. Will now be on the road until the end of the week. Next instalment from Bristol. With two days left to go in France before we pack up and head home I seem to have a fridge full of lettuce - mainly outer leaves I've saved to do something useful with. Some, frankly have had it and have had to go straight in the bin (such profligacy offends me these days) but there's still a fair amount. What can you do with leftover lettuce? Well you can make soup but somehow it doesn't seem quite summery enough yet despite a blistering 22° C here today. You can add it to another soup as I may well do with the watercress soup I'm planning for tonight. You can chuck a few shredded leaves into a French-style braised dish of peas. (That works really well) You can probably stir fry it but I suspect it may turn out a bit slimey. You can . . . what? Any suggestions welcome. Incidentally you may be interested to know there is a lettuce crisis here in southern France. The lettuce growers have gone on strike (how French) because their return on lettuces has reached its lowest point for the past 25 years. Serious indeed! The lettuce, as I've mentioned before has a central role in French meals - the French have never taken to bagged salads quite the way we have, justly taking the point of view that they're far too expensive and don't taste of much. Quite right too!